Apparently he watched football on mute for a really long time. I walked in the front door and said hi to my roommate and her boyfriend. We talked about the LSAT, the coupons we had just received in the mail (40% off espresso machine? Yes! ), and my Christmas purchases. That went on for about 30 minutes, and then I started to get a bit hungry, so decided to make some dinner. At the sound of pots and pans clanging, my roommate freaked out (thinking I'd never make it into my bedroom and find Jeff). They kept trying to convince me to go out to eat with them ("No, I'm not going with just you two! Awkward! "), suggesting we invite other people as well ("No, I'm paying for law school applications, I shouldn't spend money eating out! "), and offering to buy my meal ("No thanks Dan, you're dating her, not me!"). They finally gave in and let me make dinner (tortellini with Italian sausage and spinach marinara, yum! ), which took another 30 minutes. When I sat down at the kitchen table, I noticed that my bedroom light was on underneath my door. Weird. I grabbed my plate, and went to investigate. 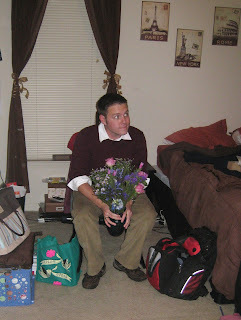 When I opened my door, there was Jeff, just sitting in my desk chair and smiling at me with a bunch of flowers! I was terrified at first (who expects to see a man in their bedroom? ), I screamed, and I nearly dropped all that marinara sauce on my white carpet (but I didnt, don't worry). Once I realized who it was, I hugged him, grinned from ear to ear, told him how happy I was to see him, and then suggested we eat tortellini. He said he wasn't hungry, but I insisted (surely he must be hungry after traveling all the way from South Carolina! ), and we sat down to eat. I complained that I don't like surprises, and told him he should've told me he was coming. I would've fixed my hair! I would've cleaned the bathroom! I would have cooked better food for dinner! He ate so fast that I assumed he was starving and offered him the rest of my plate. He decline the offer, and then randomly started walking to my bedroom. I was confused. I followed, still telling him, "You know I don't like surprises!" But then he reached into his duffel bag, turned back around, pulled a ring box out from behind his back, and said "Well...I have another surprise..." I melted. I sat down on the corner of my bed, and he knelt down in front of me and said a whole lot of lovely nice things, ending with "Katie, will you marry me?" I responded immediately with "Of course!" and lots of kisses, and then I put that lovely little ring on my finger. We called our parents, and my sister (who was in on the whole thing, and had driven to College Station and was just waiting for a call to come over! ), and had a lovely evening. Awww..cute, how I wish my boyfriend proposed to me in such a surprising way..